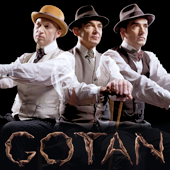 Gotan Project is a musical group based in Paris, consisting of musicians Eduardo Makaroff (Argentine), Philippe Cohen Solal (French) and Christoph H. Müller (Swiss, former member of Touch El Arab). Gotan Project formed in 1999. Their first release was “Vuelvo Al Sur/El Capitalismo Foráneo” in 2000, followed by the album La Revancha del Tango in 2001. Their music involves tango, but also uses elements such as samples, beats, and breaks.